The cooling system keeps FL vehicle's engines from overheating while they are driving around Auburndale. Its job is to move heat away from the engine. Let's talk about the various components of the system and how they make this happen. 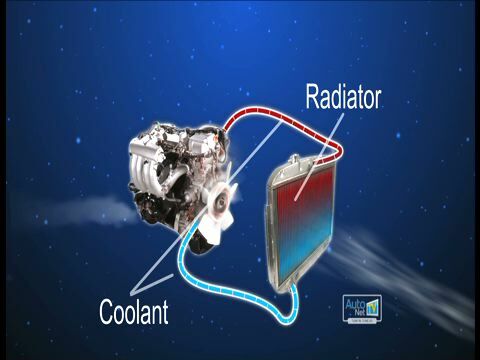 The radiator is the part most Auburndale drivers associate with the cooling system. Coolant flows through the radiator which has fine cooling fins that draw the heat out of the coolant and dissipate it into the air. To make sure there's enough airflow over the radiator, a fan pulls air over the cooling fins even when the vehicle is idling. In some vehicles, the fan is powered by the serpentine belt. On others, an electric motor runs the fan. Electric fans turn on and off as needed. You may have heard the fan kick on shortly after you turn your vehicle off. The sensor has determined that the engine needs a little help cooling down to a safe temperature. A hose connects the radiator to the water pump. The water pump pushes the water into the vehicle engine block. Now the engine block and cylinder heads have passages for the coolant to pass through without getting into the oil or the combustion chamber. In the automotive community, these passages are referred to as the "water jacket." While the coolant is passing through the water jacket, it absorbs heat from the vehicle engine on its way to the radiator for cooling. Between the engine and the radiator is a gatekeeper called the thermostat. The thermostat's job is to regulate the temperature of the engine just like your home thermostat regulates the temperature in your house. It gets your engine up to the correct operating temperature and then keeps it from overheating. When you first start the engine, it's very cold and needs to warm up. So the thermostat blocks the flow of coolant to the radiator. As the engine warms up, the thermostat starts to let coolant flow through the system. The final component the team at American Lube Express wants to point out is the overflow reservoir. This bottle is designed to hold some of the coolant. It'll have a mark that indicates whether or not you have enough coolant. This is where you should add coolant if you just need to top it off. Caution: never open the reservoir or the radiator cap when the car's hot. The cooling system is pressurized, and opening those caps while it's hot can cause hot coolant and steam to escape resulting in serious burns. Cooling system failure is the most common mechanical failure in vehicles around Auburndale, FL. At American Lube Express, we can do a periodic inspection of the components for leaks, loose connections and weakening hoses. Your vehicle manufacturer has also specified a cooling system service interval. With a cooling system service at American Lube Express in Auburndale, the old coolant is replaced with correct clean fluid that contains the additives required to prevent corrosion. The additives are depleted over time and you need fresh fluid for adequate protection. Your radiator pressure cap should be replaced at this service as well.